All of these pieces are individually very simple, but they have to be held in place with a precise relationship to each other. The microscope stand is the part that holds everything together. Because the geometry of the stand is related to the geometry of the individual components, I will go over the components that we've chosen to use for this project and how to set them up. 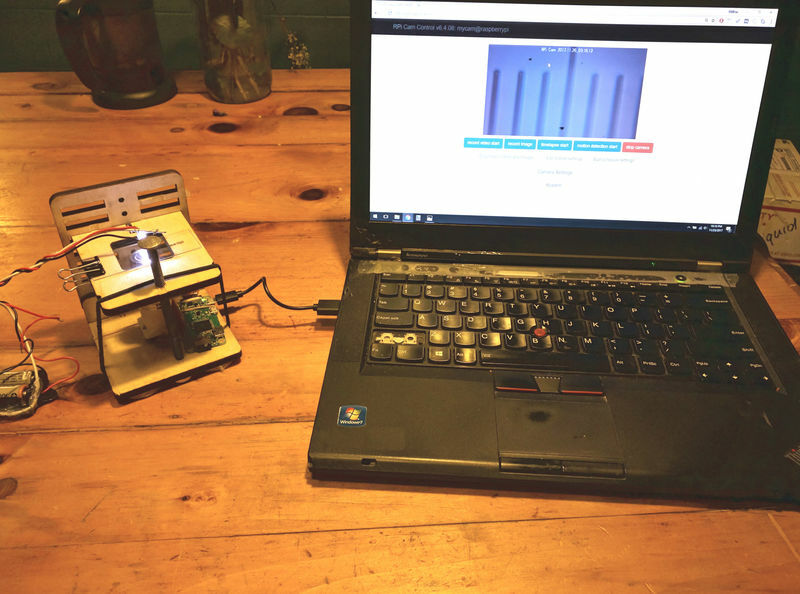 This project remixes two existing open source microscope projects -- the Hackteria scope and the Open Flexure Microscope - to make a free-standing Raspberry Pi microscope that streams video to a laptop. We'll be posting short-form build instructions in the near future. In the meantime, we've broken the project out into roughly six steps. NOTE: As this project is a work-in-progress all of these documents should be considered drafts. Step 6, in particular, deserved much more attention then we give it! 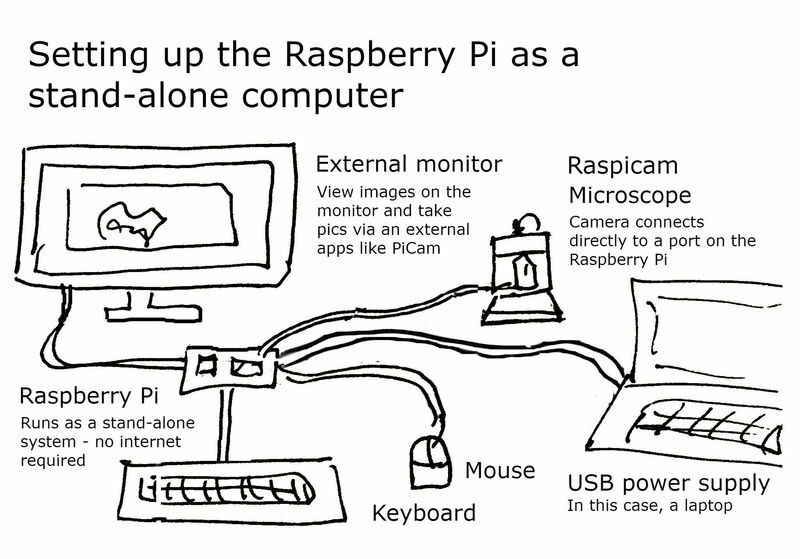 One of the common ways to think about using the Raspberry Pi is as a cheap, low-power desktop computer to which you can attach peripherals: mouse, keyboard, monitor, and power supply. 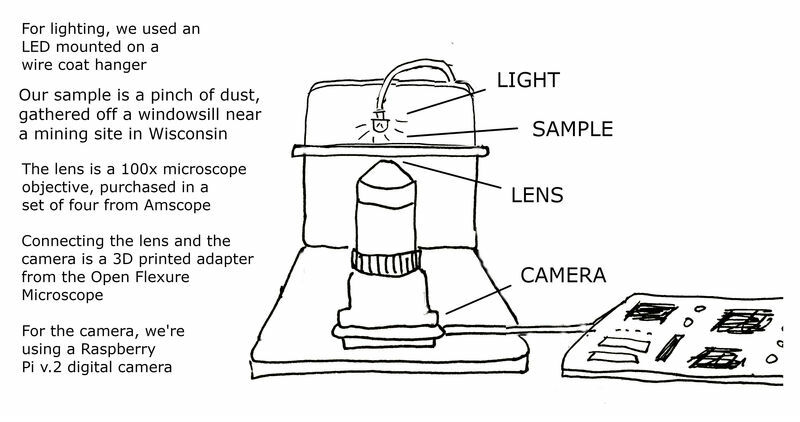 In this configuration, you would set up your microscope as another peripheral and view it locally on a monitor. This setup is great, but if we're just trying to get images from a microscope, we don't need a standalone computer; we need a way to capture photos in real time. Instead we're going to set up the Raspberry Pi Zero for wireless streaming to send images from our camera directly to the computer. We're essentially using the Raspberry Pi Zero as a web server to stream images from the Pi camera over the local network. This will let us access the images directly from any local computer by typing in a web address. It also makes our microscope significantly more portable. We use the Pi Zero W because with proper configuration the built-in wifi allows us to do all of our communication with the camera over a network and avoid ever plugging a monitor and keyboard into the Pi directly. A microscope objective is essentially a stacked lens that gathers and focuses light to magnify an image. 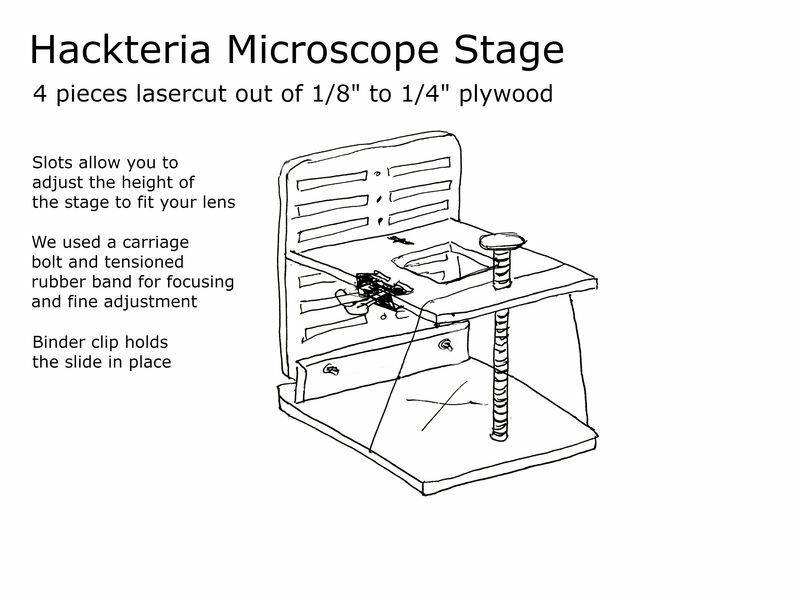 We'll be working with 40x and 100x objectives that you would typically attach to a stereo microscope. Rather than a conventional eyepiece, we're using the sensor from a Raspberry Pi camera to capture and stream images directly to our laptop. 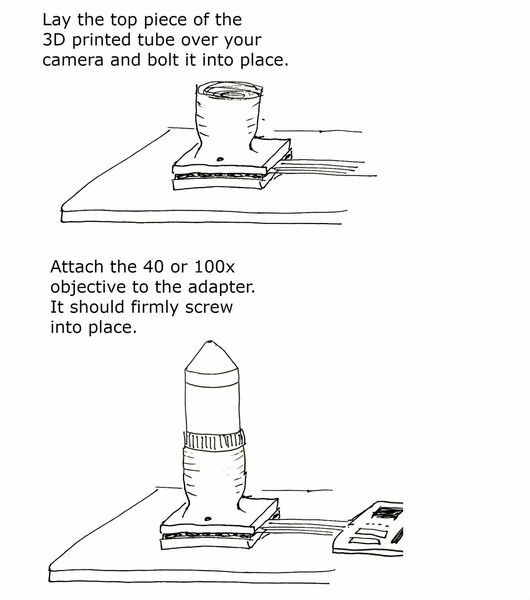 The objective is connected to the sensor by a 3D printed optics tube. Adadpting the Open Flexure optics tube. We've been using parts developed for the OpenFlexure microscope project to connect our camera to our lens. 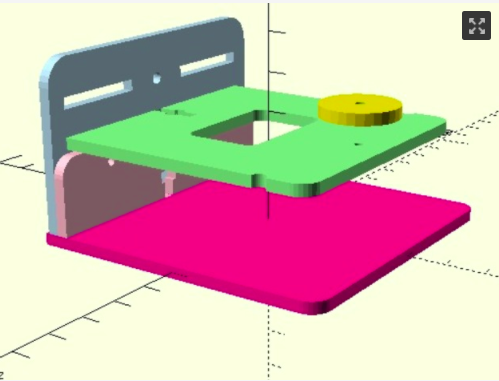 While we found the assembly process for the entire OpenFlexure microscope to be more complex and difficult then we wanted for a first DIY microscope project, they have produced a lot of useful 3D models of parts to interface with the Raspberry Pi camera. 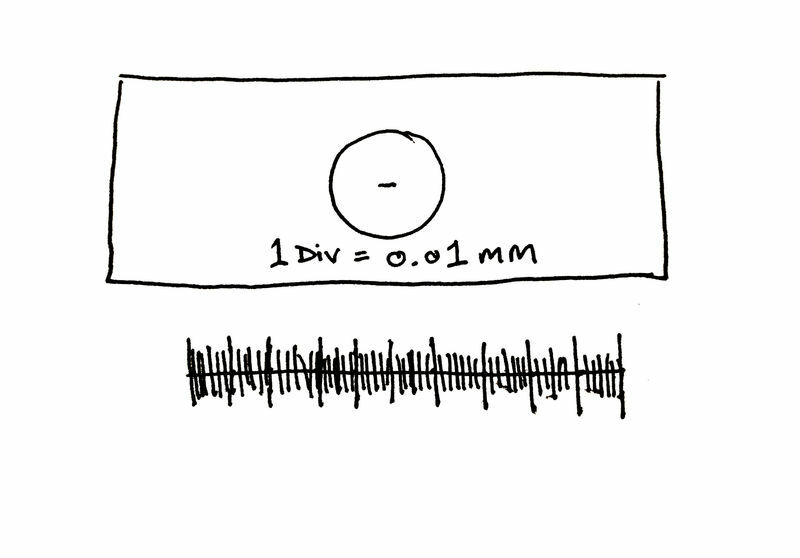 Dimensions for 40 - 100x objective. The camera holder and tube and 100x objective lens are together about 73mm tall. The 40x objective that we're using is about 2mm shorter than the 100x, but the setup for both of them is roughly equivalent. The frame is put together so that the top of the objective lens is just slightly below the surface of the stage where you will place your sample. The important thing about the illumination is that it be a small, very bright point light source. We want all of our light to be going into a very narrow aperture at the top of the microscope objective lens. Almost any light source will do, as long as it is bright enough and we can easily point it into the lens. 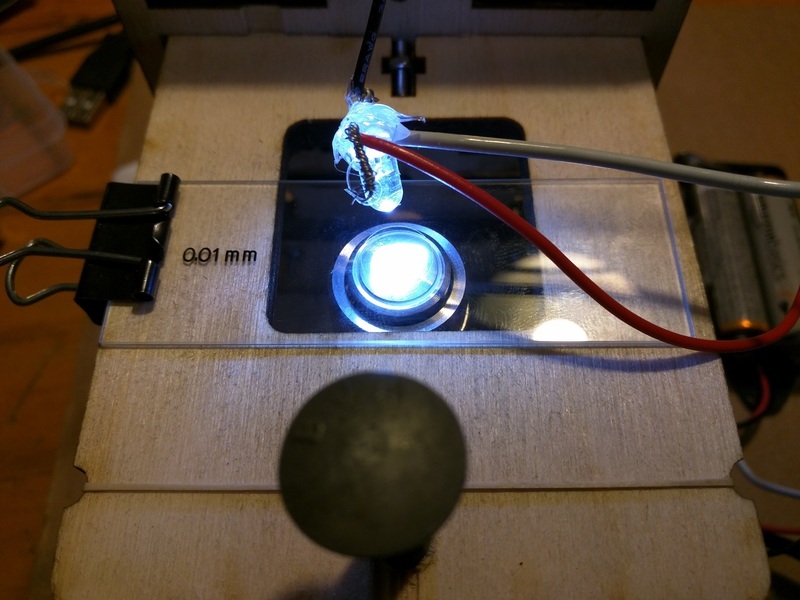 We decided that the cheapest thing to do would be just to wire up a single bright LED to a power source and glue it to a piece of flexible wire. You could save yourself this step by finding an already existing suitable light source. Our build for this involves 2 AA batteries, a battery holder with a built-in switch, some extra wires, a length of coat-hanger wire and some hot glue. This is very far from the optimal way to build this, but it works. To calibrate our microscope we will use a device called a stage micrometer. A stage micrometer is a tiny ruler mounted on a slide. Our ruler is 1 mm across and is divided into 100 ticks. 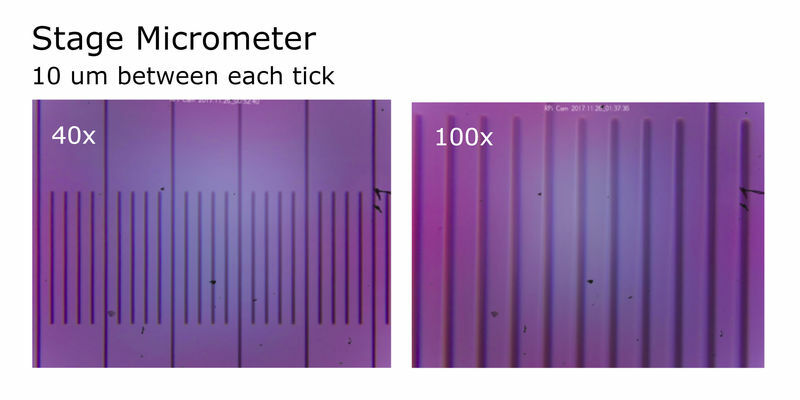 The distance between each tick is 10 microns. We looked at a couple of different samples with a 40x objective and a 100x objective to get a sense of the kinds of images we can produce with this setup. 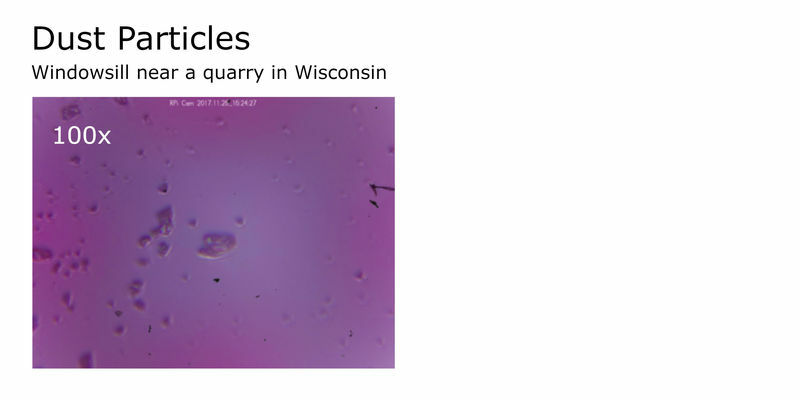 The first two are reference images; the third is a slide that (we were told) comes from a quarry near Wisconsin. 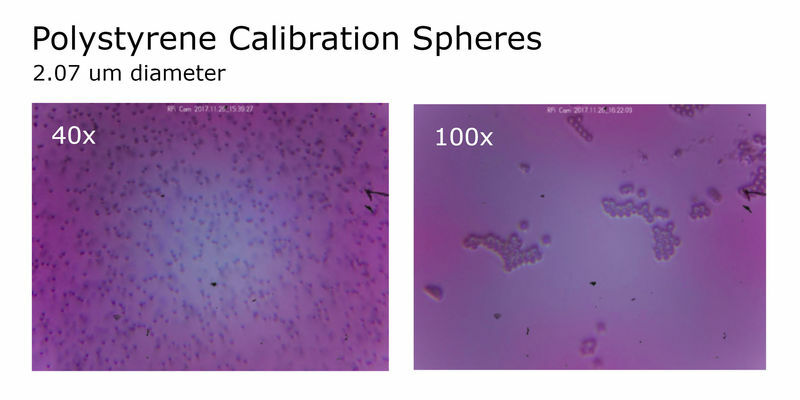 Using the 100x objective, you can make out the shape and outline of dust particles in the 2-5 um range, which gets us a step closer to being able to identify respirable particles using this setup. This looks amazing. You can embed an activities grid on your post using [activities:raspberry-pi-microscope] or whatever tag name you want to use! Then there'll be a button to post activities. I'm especially interested in the one on setting up the Raspberry Pi as a WiFi camera -- it has additional applications on the Raspberry Pi Spectrometer and Raspberry Pi Timelapse and Raspberry Pi Infragram projects! This looks really nice! I'll start assembling the parts! 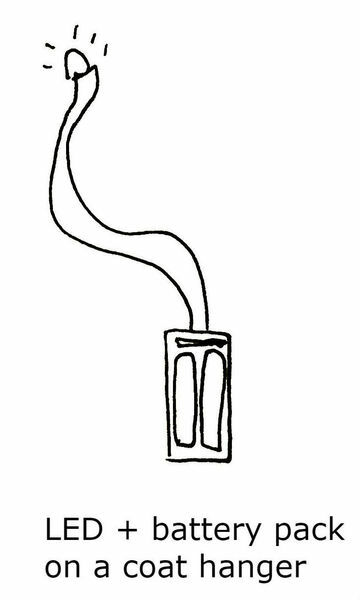 in the mean time, a small suggestion: place a diffuser (piece of parchment paper) between the LED and slide to get more homogeneous illumination. I might be wrong about it, need to setup and play with it. @MaggPi -- Sorry about that. I didn't update the link to the research note version of the instructions. I will do that now. 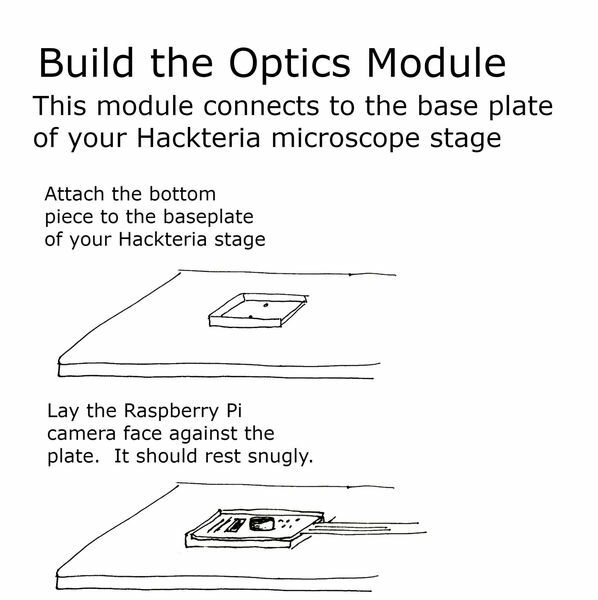 The correct links are posted on this research note: https://publiclab.org/notes/partsandcrafts/02-15-2018/2-attaching-your-raspberry-pi-camera-to-a-microscope-objective-lens -- I am copying them below as well. New model.3mf (Polyamide (SLS)/Natural white): • extra surfaces with no thickness have to be eliminated. • The walls of your model are not thick enough. This might cause fragile parts to break during printing. You can find the recommended minimum wall thickness for Polyamide (SLS) in our design guide or you can read our tutorial about choosing the right wall thickness. I also wonder if you could choose a different material or try ordering from another vendor? I see the little triangles of zero-thickness. My slicer (Simplify3D) ignores them, so it looks like they will print okay. @MaggPi, would you like me to send you a couple of prints of those parts? @Maggpi @Warren please consider deleting any message with personal details. Whoops, I just noticed this. I will try to print the parts and let you know how it works. Sorry for the delay.